Recently Peter Sinclair Posted a video (which I linked to in my sidebar) titled ” What is up with Watts?” as part of his excellent “Climate Denier Crock of the Week” series. In it he debunkes (again) the notion that the increase surface temperature record is due to the heat Island effect. That video has since been pulled from YouTube by a (likely fraudulent) DMCA takedown request. As the title of the video implies, Sinclair focuses much of this video on Anthony Watts and his SurfaceStation.org project. The point of the Surface Station project is to document temperature stations that do not meet the the criteria from NOAA’s Climate Reference Network Site Handbook. Given the number of stations (1221 in total) it should not as no surprise that they do not all adhere to the strict requirements set out by NOAA. So the SurfaceStation.org project does ask a valuable question: ”Is the surface temperature record reliable?” The problem lies in the conclusions drawn from the data collected by the project. Watts has claimed that the problems documented by SurfaceStation.org indicate that the temperature record is unreliable. And that is what Sinclair addressed in his video. The main line of evidence used by Sinclair is a recent analysis done by NOAA NCDC where they compared the 70 surface temperature stations that SrufaceStation.org classified as good or best with the whole Climate Reference Network. In other words NOAA accepted the question posed by SurfaceStation.org as valid, and conducted an investigation in order to answer it. Two national time series were made using the same homogeneity adjusted data set and the same gridding and area averaging technique used by NOAA’s National Climatic Data Center for its Page 3 of 4 annual climate monitoring. One analysis was for the full USHCN version 2 data set. The other used only USHCN version 2 data from the 70 stations that surfacestations.org classified as good or best. We would expect some differences simply due to the different area covered: the 70 stations only covered 43% of the country with no stations in, for example, New Mexico, Kansas, Nebraska, Iowa, Illinois, Ohio, West Virginia, Kentucky, Tennessee or North Carolina. Yet the two time series, shown below as both annual data and smooth data, are remarkably similar. Clearly there is no indication from this analysis that poor station exposure has imparted a bias in the U.S. temperature trends. So while SurfaceStation.org raised an interesting question, the data indicates that the surface temperature record is reliable. Obviously this isn’t what Anthony Watts wanted, so what did he do? Well, there isn’t much he can do about the NOAA report, but there is something he can do about the Sinclair Video, thanks to the DMCA. More specifically the takedown provisions. Those provisions basically state that if YouTube wants to be considered a safe harbour (meaning that they cannot be sued when a user posts a video that violates copyright) they need to takedown any video if they receive a takedown notice. This is a very problematic aspect of the law since it allows anyone to force videos off YouTube and other sites with relative ease. In fact this has become so common that the EFF (with the help of a few others) have set up a website (ChillingEffects.org) documenting the problem. Legal actions and threats of legal action are being used with ever greater frequency by quacks, complementary medicine practitioners, cults and corporations  to stifle scientific criticism of their claims. It’s a worrying trend. So despite the video certainly falling under fair use, and not containing anything that I though violated Watt’s copyright, he sent YouTube a DMCA takedown notice. For shame! Why are deniers afraid of debate? As mentioned above Google (who owns YouTube) didn’t agree. They didn’t have a choice in the matter if they wanted to maintain their safe harbour status. And they do want to keep it; without it they would be sued into oblivion. So Watt’s description of the event is misleading. We don’t know Google’s position on the matter. No one at Google looked at the Sinclair video. DMCA takedowns are a mostly automated process; YouTube gets a truckload of them every day, and I doubt Watts has a high enough profile that Google would waste a human eyeball on his complaint. Now maybe he took issue with the short (credited) clip at the beginning from Will Ferrell’s Anchorman movie…. but I think this is more about a video that thoroughly shreds Watts and his argument that the world is wrong about climate change and he is right. If that was the complaint Watts’ was making then he just committed perjury since he doesn’t own the copyrights to Anchorman, and I doubt that he is authorized to act on the behalf of the copyright owner. And while I wouldn’t put this past him, my bet is his ‘objection’ lies somewhere else. Perhaps with the content of the video? In fact if the claim is with the content, then he also committed perjury. So what options is Sinclair left with? The DMCA counter-notice and put-back procedures, is a good place to start. But this is simply yet another in a long line of abuses of the DMCA. Shame on Watts for not accepting honest criticism. Shame on Watts for relying on censorship, and trying to silence his critics. Why are deniers afraid of debate? UPDATE: The video has been reposted. The video has since been reviewed by a number of US copyright experts and (big surprise) there appears to be nothing that could be construed as anything but fair use. UPDATE 2: Anthony Watts has now responded in a very long post over at his blog.Wading through the riffraff one finds a whole lot of filler, and baseless accusation. As well as complaints of ad hominem attacks against him, followed immediately by ad hominem attacks made by Watts against his critics. Standard denialist stuff. I noticed that he did in fact use photographs and graphics from my published book “Is The U.S. Surface Temperature Record Reliable?”. 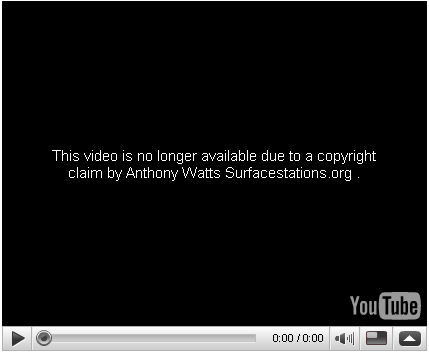 Obviously Watts is clueless as to what constitutes Fair Use. A few graphics from a book, in a video about that book would certainly be considered fair use. This situation is made more absurd by Watts insistence that he wanted to provide Sinclair with a teachable moment. But shouldn’t you familiarize yourself with the subject at hand before you try and teach it to someone else? Otherwise your teachable moment is going to backfire and make you look like an idiot. And it has. Two national time series were made using the same homogeneity adjusted data set and the same gridding and area averaging technique used by NOAA’s National Climatic Data Center for its annual climate monitoring. Seems reasonable, until you understand what “homgenization” really is. Huh? Is Watt’s now complaining about homogeneity adjustments in the data? This is a complete shift for him, and he doesn’t have a leg to stand on. His main complaint with the surface temperature record in the past has been that it suffers from inhomogeneities (ie: changes in instrumentation, station moves, changes in the local environment such as urbanization). Having him now complain about homogeneity adjustments is absurd. Were NOAA NCDC to use data suffering from inhomogeneities their conclusions would be useless. They would be comparing apples to oranges. Homogeneity adjusted data is a must. Watts’ other complaint is that NOAA used an old data set. This may be a valid complaint, though presumably it is the same data set found in Watts’ book. But if the new data set provides a different result why hasn’t Watts published that result? And if the old data set is problematic why was it sufficient as the basis for Watts’ book? The Streisand effect is an Internet phenomenon where an attempt to censor or remove a piece of information backfires, causing the information to be widely publicized. Because of Watts’ action many more people are now aware of Peter Sinclair’s excellent “Climate Denier Crock of the Week” series. UPDATE 3: YouTube has accepted Peter Sinclair’s DMCA counter-notice and put-back request, and restored the video.